Over the last few years, the SSPC ASHRAE 52.2 Committee has made a variety of important changes to the standard. While none of these are as dramatic as the optional Appendix J Conditioning test, they all had a purpose and can affect the industry from a development and marketing perspective. In total, 6 addenda have been published since February of 2015 lettered A through F.
“A” MERV table change – a rework of the tables to resolve known problems in determining some MERV ranges. “B” Shedding data – a more specific way to deal with re-entrainment of dust during arrestance testing. “D” Relative humidity – a refinement of the allowable RH in the ambient test air as well as the aerosol generation including air inside the test duct. “C” OPC counter – a change in the technology for particle counting instrumentation where only optical particle counting technology is allowed. “E” “MERV” restriction – the use of the acronym “MERV” was limited to use on “only” tests conducted using the full ASHRAE 52.2 protocol. The most important change is Addendum A. This modified the existing MERV table that had been in existence since the original publication of the standard itself. The most critical areas of the changes were MERV 8 and above. This decision was made with a conscious effort to offer more delineation between MERVs as frequently, some product testing results could vary back and forth from MERV 8 to MERV 11. Similar jumps were seen between MERV 12 and 14. Addendum B deals with the re-entrainment of the ASHRAE test dust during testing and how it can affect the test. This primarily affects filters that test MERV 4 or lower. More often than not there will be a negligible affect on the filter, however for someone attempting to verify if a report uses the new supplement it is now required to be reported in the test report itself. To reduce the variation, the committee reduced the spectrum to 45% ± 10. This area is where the research project showed the least amount of volatility. The goal was to increase the repeatability and reproducibility of the ASHRAE 52.2. Therefore when examining a test report it is important to look for the relative humidity and if it lands between 35% and 55%. Another step the committee has taken was the adoption of Addendum C. Previously the standard allowed for the use of alternate counters beyond optical particle counters to be used during testing as long as the testing body could properly correlate. Per research project 1287 the results showed that even this could be difficult to do and easily mistaken. 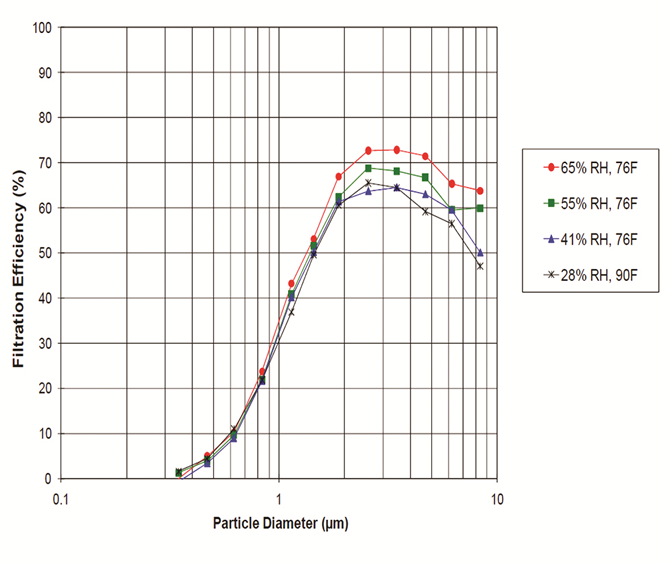 To eliminate this issue, Addendum C simply allows only the use of optical particle counters. Addenda E and F were the most recently published items and moved through committee very quickly. Addendum E deals directly with the term MERV. It is short and to the point. Only those tests that have been run per the letter of the methodology may use the term MERV in the report itself. For example, a test that was run with the initial fractional efficiency may not use the term MERV. Also, filters that are tested with ISO fine dust as the loading dust instead of ASHRAE dust may not use the term MERV on the report. Addendum F is the most recently published addendum to the standard and is likely the least noticeable. It requires the full data set of efficiencies to be published in the report. A finished report must have the efficiencies of all 12 channels from each set of efficiencies included. This would result in 72 individual efficiencies laid out in table format. Most laboratories have already been doing this for some time now. So the question the average consumer must ask is, are filter manufacturers and test labs simply allowed to go back and re-label products and test reports. After all, the areas of concern here cover well over 50% of the total market in sales. The resolution the committee came up with is the best work around given the test method had not been republished. Since Addendum A was published as a supplement to ASHRAE 52.2-2012 with Addenda B and D, only those test reports that adhere strictly to all three addenda shall be allowed to be republished or use the new table. Any other products must be retested, and again must use the new methodologies to use the new MERV table. For the customer it is critically important to look for the strict verbiage of “ASHRAE/ANSI 52.2 with 2015 Supplement”. This is the only way to verify that all parts of the supplement were properly used. Restricting the allowable measurement technology to only optical particle counters narrowed the reported data product into a more manageable arena and further enhanced the “narrowed variability” objective. Historically, labs had focused on this technology anyway. The change was considered to be a minor one but all members of the committee did not embrace a “limiting technologies” perspective. The hard fought consensus achieved by the committee is expected to tangibly improve the standard as a benchmarking tool. Only time will tell how this plays out. The limited use of the “MERV” acronym in Addendum “E ” may actually become the most controversial of the addendums discussed here. Many users of the standard and its data products have become accustomed to unrestricted use of the term and therefore, have developed some misdirected marketing habits. Indeed, the abuse of the term has lead to some controversial applications that have been labeled everything from “uninformed” to “unethical”. Since ASHRAE has maintained a clear stance on remaining neutral on these issues (example – no copyright effort was made by ASHRAE to protect the “MERV” acronym), there is no meaningful penalty in misusing it. As long as that remains in effect, the abuse may likely continue. The SSPC 52.2 committee predictably has more work to do in this area. Comparatively, Addendum “F” could be considered the least controversial of the six addenda. It is a simple requirement to report all counting data in the finished report, something most laboratories were doing already. The goal here was to give informed end users the ability to find the right product for their specific situation. For example, if a user needs to have a filter that removes more than 90% of 1.0 µm when the filter is brand new, they can look up that specific value in the report rather than guessing what MERV is applicable. Adding the requirement is viewed as a leveling of the complexion of the test reports. The six addenda discussed here were all proposed and orchestrated by the SSPC 52.2 committee in an effort to minimize the existence and impact of the known variability of the data product from the test protocol. It will of course, take time and open-minded patience to assess the efficacy of such an effort. The details illustrated here for the reader are provided as a backdrop for making that assessment. Hopefully we can write another article in a few years, detailing the success of each of these consensus undertakings. Robert “Bob” Burkhead has been president of Blue Heaven Technologies since its foundation in July 2004. He has strong technical experience in research and development with patents and design awards. He has 35 years experience in air filtration product development and production activities, including 25 years spent with two major air filtration manufacturing firms. Michael Corbat is the Engineering Manager at Custom Filter LLC located in Aurora, Illinois. Michael has 15 years of filtration experience and work in filtration product development. Corbat is a member of NAFA, and Chair of ASHRAE Standard 52.2 Committee.